"Amazon Appstore selection has nearly tripled over the past year, and since Fire phone launched, the rate of app submissions to the Amazon Appstore has more than doubled. App submissions are at record levels in the five week period since launch. In the few weeks since Fire phone launched, developers have already found innovative uses of the phone’s enhanced carousel, Dynamic Perspective and Firefly", says Amazon. Mike George, Vice President, Amazon Appstore explains, "When we launched Fire phone, we couldn't wait to see what developers were going to build with Dynamic Perspective and Firefly. While the underlying technologies for Dynamic Perspective and Firefly are sophisticated, we've made it simple for developers to harness their capabilities. Developers can mix and match APIs from the Dynamic Perspective and Firefly SDKs with standard Android APIs to create the best experience for their app or game. And in just the few weeks since we unveiled Fire phone, we've been blown away with the new, innovative use cases developed with these groundbreaking technologies". 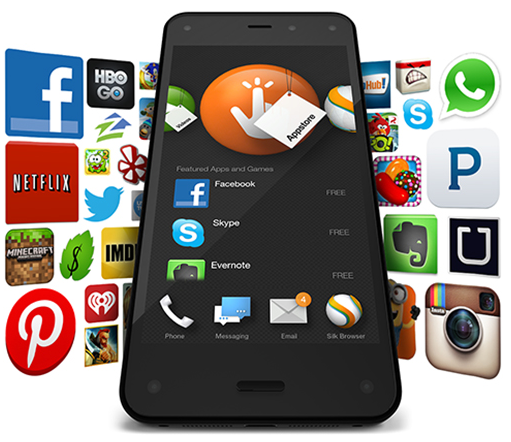 Not only are companies such as eBay, Groupon, Fandango, Sega, TV Guide, Wall Street Journal and Whatsapp embracing Amazon's Appstore, but they are also customizing their apps to take advantage of the unique features of the Fire phone. This is key if Amazon's phone is to be a success. Time will tell if that will happen, but hopefully more developers continue to jump on board and increase the value of the device. Heck, more choice and competition is good for consumers, right?